Recipes to make household products. I used to buy an expensive cleaner that promised to remove calcium and other deposits. It worked great, but I thought it was expensive. Since then, I discovered some of the many uses of vinegar. If your shower head has developed a calcium/lime scale build up, there is no need to run out and buy some expensive cleaner. For this, I used an old margarine tub. 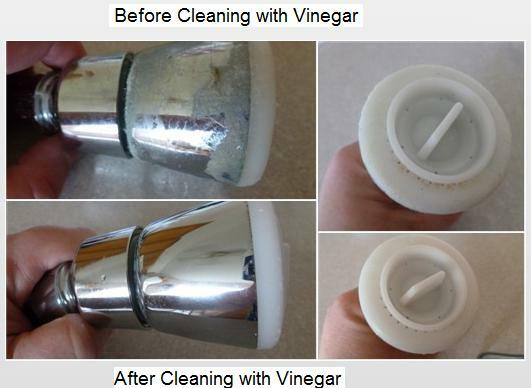 Pour enough vinegar into the dish to cover the build up and soak the shower head. I started to see results after just a few minutes, but for good measure I soaked mine for about two hours. I then used an old brush to get in the crevices and now I have a clean shower head! With all the rain we’ve been having lately, I know my yard is going to need more attention. If you find yourself with a yard full of weeds, there is no need to run out and buy those expensive weed killers. 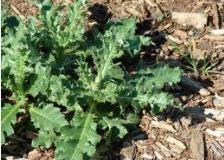 Our HOA published this homemade weed killer recipe in their newsletter a few years back. I think it works just as good as the store bought stuff. I usually mix this up by the gallon a day before I plan on using it. The salt seems to dissolve better if I mix it up early. I also find that it works best if I spray the weeds early in the morning so the sun has all day to shine on them. Make a solution of one cup bleach and two cups warm water. Be careful not to spill or spash the bleach solution. Wipe the door seal with bleach solution and soft cloth. Fill bleach dispenser with chlorine bleach. Run the washer through a complete cycle using hot water. Repeat the wash cycle if necessary. My washing machine manufacturer recommends doing this process every 60 to 120 days. I do this process on the first of the month. Mix all ingredients, add one tablespoon to each load. I generally add a tablespoon to the pre-wash compartment of each load. This cuts down on the amount of dishwashing detergent I buy. For our needs, this works great as a pre-wash. I tried it for the pre-wash and main wash, but I had a problem with stuck-on food. I usually mix this up a day before I plan on using it. The salt seems to dissolve better if I mix it up early. I also find that it works best if I spray the weeds early in the morning so the sun has all day to shine on them. I found this recipe back in 2004, and you can go HERE to find the original and read more details, but if your lawn is struggling in the summer heat, this concoction can help. Pour all of the ingredients into a 10-gallon hose-end sprayer (other sizes will work too). In high heat, apply every three weeks.